The Scuderia Ferrari Bicycle Kid Team 12 Yellow is one of the finest products by Ferrari bicycles. This kid bicycle is light in weight at the very same time it offers high resistance. The design is so made to suit the safety of the kids as well as to provide style. The cycle is light in weight hence it can be easily handled by the kids. It is suitable for kids of Age 4 to 6 years. It has adjustable steering handlebar and seat. So as your kid grow adjusting the seat and the handle is possible. Being a Ferrari product the braking system used is excellent. The brakes are on the rear wheel of the bicycle and it has fenders so that the kids can stop the bike where they want. Many customers said that because the bicycle is so lightweight in weight. It is very easy for their kids to handle the bike and to learn to balance on it. Because of the adjustable seat and handle provided. As the kids grow they can elevate the seat so that the kids do not have any problem pedaling. The plus point is that the kids do not quickly outgrow the bicycle. The safety measures given in this bicycle keeps the kid safe there are no issues of the skidding of the bicycle like other bicycles do. Attaching the side wheels or the supporting wheels to the bicycle is very easy. Hence, once when the kids learn to balance the bicycle on their own the parents can remove the side wheel themselves. Because of the alloy used in the making of the cycle, the cycle is really sturdy. No matter how many times the kids fall. The cycle just remains the same with no change in the alignment. The bicycle is a value for money because once you buy a bicycle for your kid it will be there for the next 2 to 3 years. Purchasing the cycle doesn’t seem heavy on their pocket. The bicycle comes with a warranty of 12 months. And this purchase is a value for money. provided in the bicycle protect the kid from falling and help the kid in being safe when riding on the road. Yes, the seats of the cycle and also the handle of the bicycle are adjustable. It gives you a wide scope for adjusting the seat and handles so that your kids do not outgrow the cycle quickly. Scuderia Ferrari Bicycle Kid Team 12 Yellow is a product from Ferrari which makes the use of best quality alloy 6061 for the mainframe and the handle of the bicycle. Also, the rim is of HJC alloy CIL which makes the bicycle durable. What is the dimension of the bicycle? The size of the cycle is 12 inch and the height is 80 cm and the width of the cycle is 18 cm. Total weight of the bicycle? 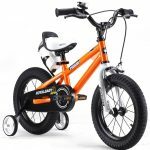 The cycle has got special alloys and hence it makes it really light weight for kids. The total weight of the cycles is 11 kg. Wheel size of the bicycle? Can I attach accessories to the cycle? Adding accessories to the cycle is very easy. Ferrari offers a wide range of accessories like basket, flywheels or support wheels, sipper holder, etc. What is the warranty period of the cycle? The bicycle comes with a warranty period of 12 months this warranty is on the frame of the cycle. Colours that I can get in the cycle? The bicycle is available in two colors that are red and lemon yellow. Kids of which age range can ride these cycles? How many years can the cycle last? Because of the alloy used in the cycle and in the rim of the wheel the cycle is very resistant and strong. If taken proper care and service of the cycle the cycle will easily last you for 3 to 4 years. 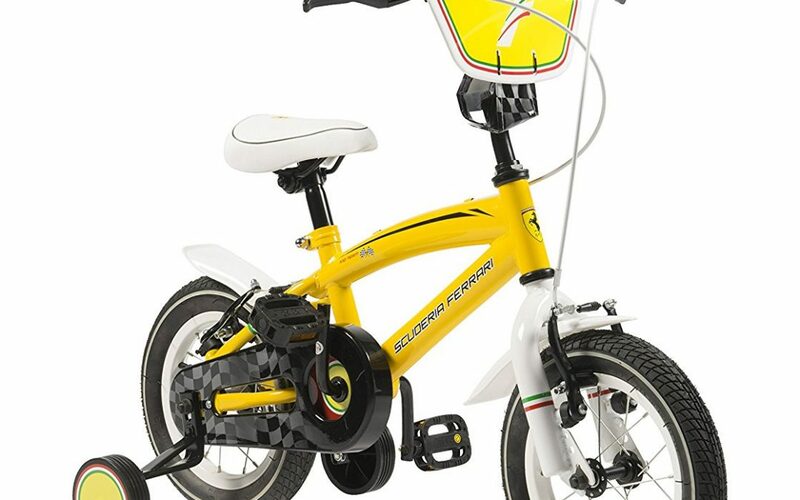 One must buy this Scuderia Ferrari Bicycle Kid Team 12 Yellow for their kids because it is completely safe for them. It is lightweight, sturdy and comes with a warranty of 12 months. Because of adjustable seats and handles unlike most of the bicycles. This bicycle can be used by the kids for a longer period of time.